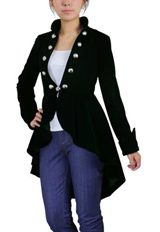 This flocking velvet jacket, features some knob buttons, one can be closured, little loose sleeves, the back flare over the hips, shorter in front, fully lined. Standard size approx. length: 36.02 inches; Plus size approx. length: 40.08 inches. hi will this jacket be available in a dark navy blue anytime soon???? ID REALLY love one! :D thanks!! !